Crochet solid granny squares to make a modern baby blanket with a gingham design. Sew up a simple drawstring bag to make a fun noughts and crosses travel game, otherwise known as Tic Tac Toe, with this simple tutorial. A quick and easy handmade gift idea, geometric leather coasters. Mix, bake and cool slightly, these chocolate chip and orange flavour porridge oat cookies can be ready to eat from start to finish in about 30 minutes. Make cheap and simple valentine decorations from old plastic food containers and nail varnish. 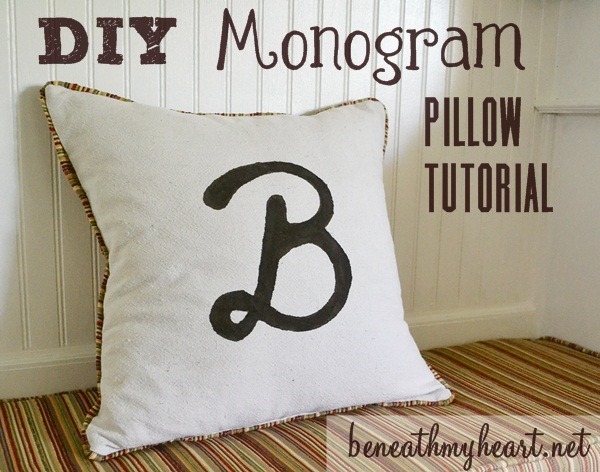 Monogramed Cushions or pillows are a bit of a home decor classic. If you have basic sewing skills it's not difficult to have a go at making them yourself. I realised a few weeks back that I'd missed sharing the gift I made for the final wedding in our 'summer of weddings'. If you're curious I shared the gifts I'd made for the other weddings here, here and here. I wanted to make something classy and unfussy for this couple as that suits their style but still wanted it to be personal for them. 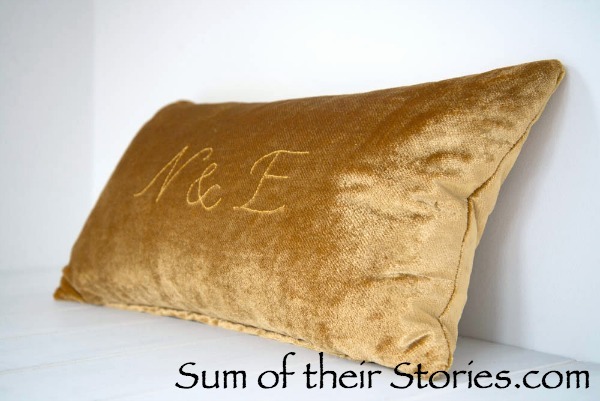 After some deliberation and time on pinterest searching for inspiration I took a plain gold shop bought velvet cushion cover and embroidered the couples initials in a very simple back stitch. I found this plain gold cushion in TK Maxx and fell in love with the velvet. A plainer fabric would actually have been easier to stitch on but the velvet has a beautiful sheen and texture which I do love. I also chose an embroidery thread the same colour as the fabric so the embroidery is subtle, you could easily do a contrast for a bolder effect. I used the font "Small Roundhand" for the N and & but I didn't like the E in that font, it was one of those backward 3's so I did the E in "Apple Chancery". 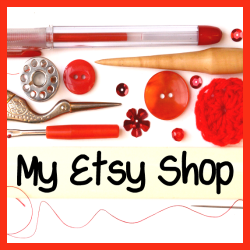 If your PC doesn't have lots of great fonts you can use Picmonkey, Ipiccy or some other photo edit online site in design mode as they have lots of cute ones. Print out the initials in the size you want, this will depend on your cushion cover size of course. You may have to print it a few times until you get the size right. Trim the paper close to the initials then pin the wherever you want them on the cushion. I did mine centrally but yours could be anywhere you like. Use loads of pins so it doesn't slide about. Using 2 strands of embroidery thread stitch the initials in backstitch going through both the paper and the fabric. When you are done, gently pull the paper away. I found it easiest to tear the paper as close as I could to the stitching first then the little bits just pull out easily with your finger nails or tweezers. Simple as that! You can see in my photo above that I had trimmed away the paper around the letters as I finished each one, that is not necessary, I was just checking it had worked! All these photos are taken on an angle as that shows the embroidery better, with the nap of the velvet it was hard to get the initials to show up nicely on a photo. 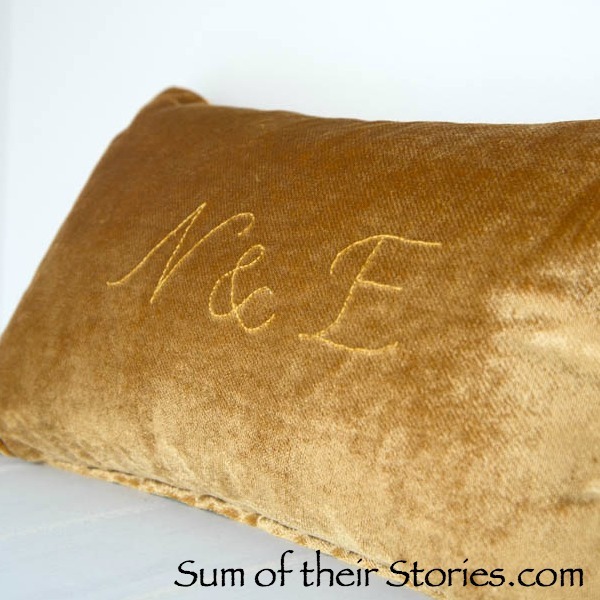 If my velvet initials cushion doesn't take your fancy or suit your style how about some of these beautiful DIY monogram cushions and pillows. This beautiful cushion was made by Robyn from The Farmer's Nest, it's another done on a ready made cover using a super simple embroidery stitch. 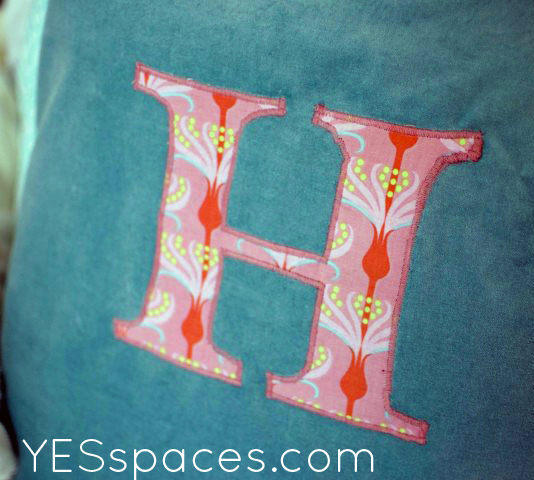 I love this twirly font Trisha from The Sweet Survival chose for this felt monogram pillow, so classy. The Sweet Survival site doesn't exist anymore so this is just an inspirational photo now. How Does She and has a great step by step tutorial. This cover from Beneath my Heart has a stencilled monogram. The tutorial includes a great set of instructions of making the cover, including that pretty contrast piping. Another stencilled idea from Merrick's Art, so simple, so effective. If more colour is your thing, how about this beauty from Yes Spaces. It's made using a traditional machine applique method and a ready made plain cover. It would be a great way to use up fabric scraps. This is a little bit different, a letter shaped cushion. What a fun idea from Classy Clutter. 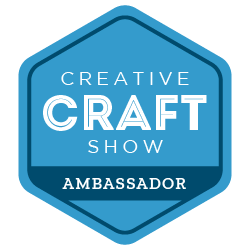 I do love a good "crafting with buttons" project and this one from It all Started with Paint, is just lovely. This beautiful letter made from fabric rosettes is so pretty. Kaitlyn from The Birds Nest used a liquid stitch glue so this is a "no sew" option, but of course you could make a "sew" version if you prefer! 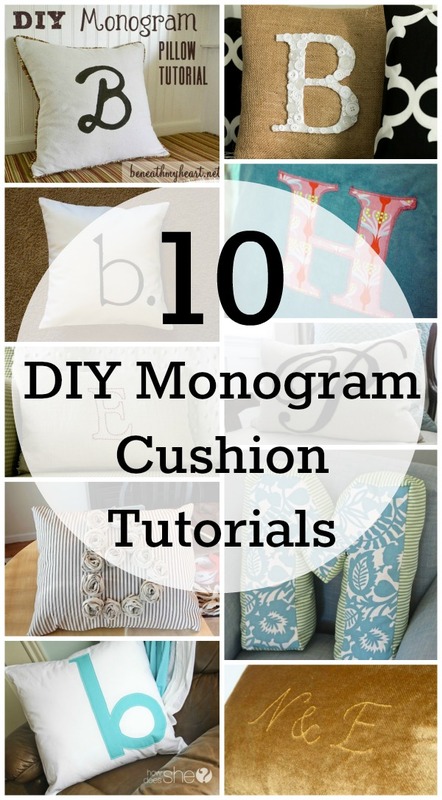 Whether you call them cushions, pillows or something else entirely, hopefully you have found some letter and monogram inspiration here. Funny how so many of these tutorials are for the letter B - 5 out of the 10 - I wonder why that is? Saving an old piece of knitting and turning it into a little clutch was a bit of a fiddle but I think, well worth it. What a fun way to use up left over scraps of yarn. If you know basic crochet stitches you can make a super cute amigurumi owl! Inspired by a pattern from the brilliant Kristi Tullus. Turn old scrabble tiles into a piece of art by spelling out a favourite quote. Pretty wedding gift wrap idea using crochet flowers and a romantic papercut gift. I love Cath Kidston's beautiful designs so used some scraps of pretty floral notepaper to makeover an old bracelet.